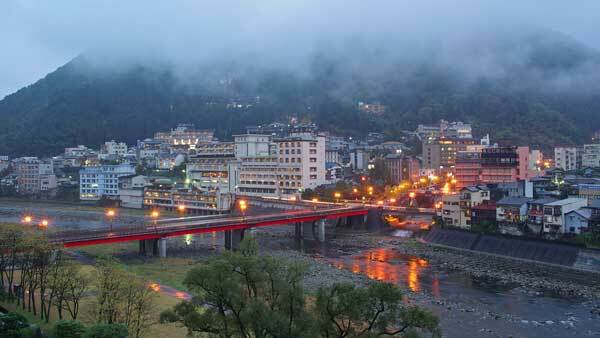 Atami Onsen is one of Japan's most outstanding hot springs resorts. 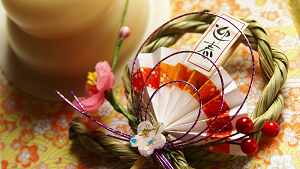 It is known to have been favored by Tokugawa Ieyasu, Japan's first shogun. 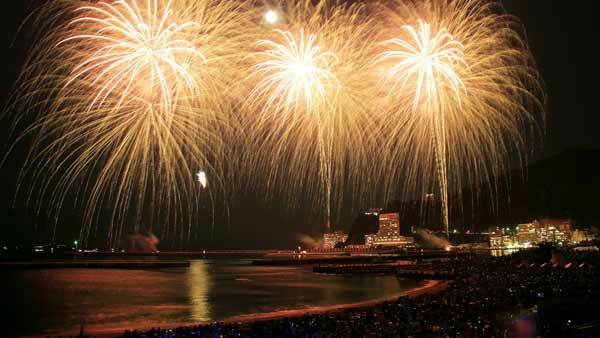 The year-round marine fireworks displays are famous. Truly worth viewing is the beauty of the unique terrain as a backdrop to the power of the fireworks. 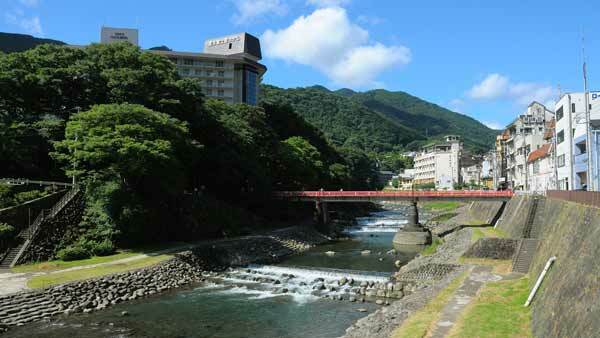 From Tokyo, Atami is an easy 50-minute trip by bullet train. To top it all off, a nearby beach is popular with families and bathers in the summertime. The sheer quantity of water flowing from these hot springs ranks second world-wide, exceeded only by the springs in Yellowstone National Park in the United States. 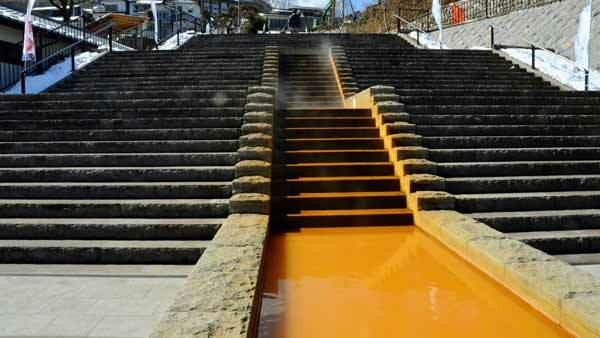 But this is the world's largest hot springs where people can bathe. The "Beppu Hatto" consists of eight major hot springs areas -- Beppu, Kannawa, Kankaiji, Myouban, Kamegawa, Shibaseki, Horita, and Hamawaki, each with individual spring qualities for you to enjoy in turn. These run the gamut from spas in town to springs nestled within natural green landscapes, each offering its own unique enjoyment. 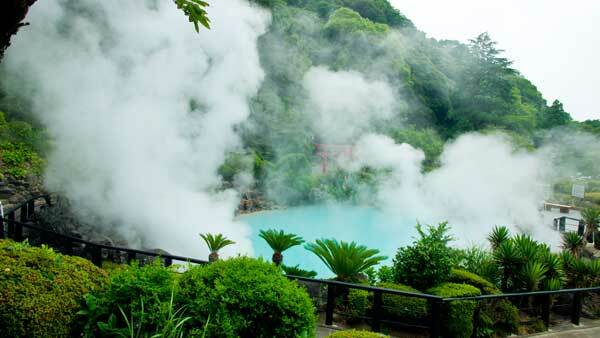 Aside from bathing, you can also enjoy touring through nearby attractions such as the "Hells of Beppu." 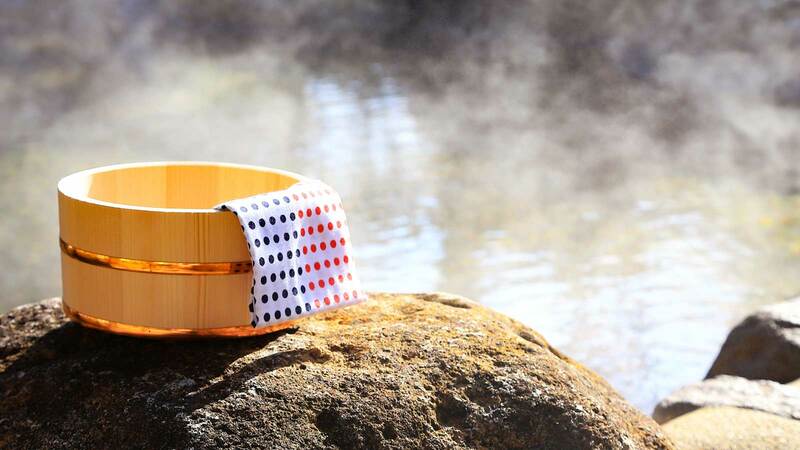 These hot springs are simply overflowing with an abundance of deeply satisfying hot water of good quality, emerging at the surprisingly high elevation of 1200 meters. With Yubatake as the centerpiece, the quaint atmosphere of an early spa town prevails even today, where you can stroll the streets in a relaxing cotton yukatarobe and can take delight in touring the public baths, among many other things to do. 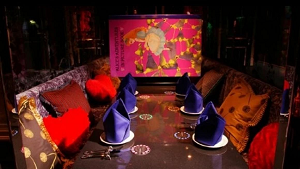 The stunning variety of available lodgings ranges from purely traditional Japanese inns, the ultimate in relaxation, to tourist hotels perfect for tour groups, resort hotels popular with families and couples, bed-and-breakfast style guest houses that are called pensions, and simple rooms to let. These highland resort hot springs are located on a mountain plateau. 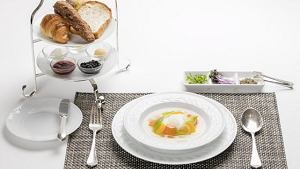 Their history spans 1,300 years since their opening and they have been popular since ancient times. 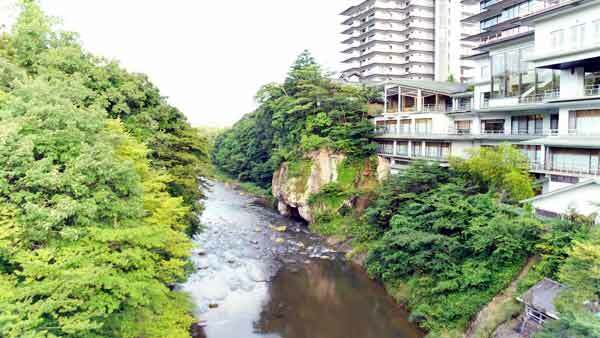 The seven spring sources are called Shika-no-Yu, Ben-Ten, Kita, Daimaru, Takao, Yahata, and Sandogoya. Together they are called the "Nasu Nanayu". 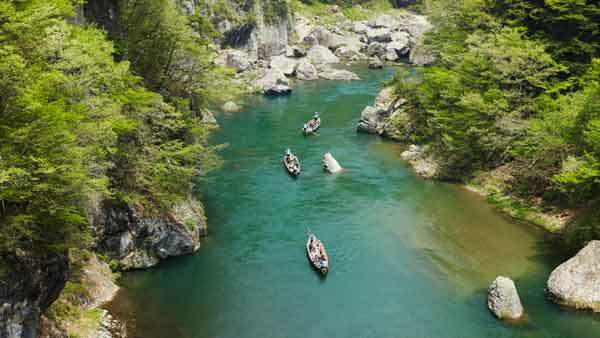 You can get from Shinjuku to Kinugawa Onsen in just two hours or so. 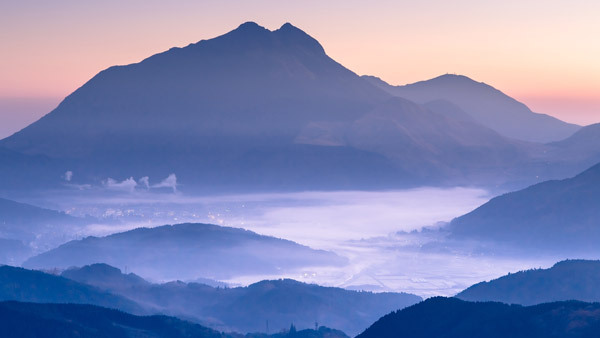 The town's main street is lined with hot springs inns where you can enjoy superb views of the Kinugawa valley's natural landscape from your room as well as the copious quantities of steaming water in the baths. The town also features many attractive leisure facilities. It is very popular with families and group tours during the summer. The history of this venerable hot springs resort goes back over 1300 years. 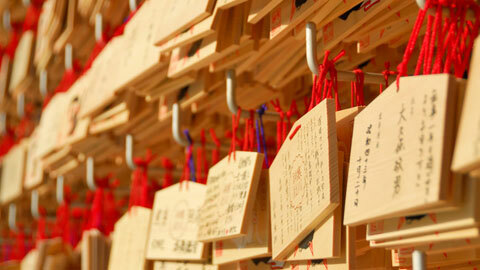 It has hosted Emperor Saimei, Emperor Tenji, Empress Jito and her husband Emperor Monmu, and numerous priests. Nowadays it has plenty of popular fun to offer, including Adventure World and Shirarahama, making it a steady favorite of adults and children alike. These amazing hot springs pour forth 32,000 liters of hot water every minute, a quantity exceeding almost any other Japanese hot spring. The springs are primarily of two types: simple springs that are gentle on the skin, and weak salt springs with superb thermal effects. 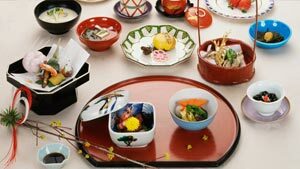 With fresh seafood from Sagami Bay and fine local mandarin oranges on hand as well, this major resort offers the abundant blessings of both the mountains and the sea. 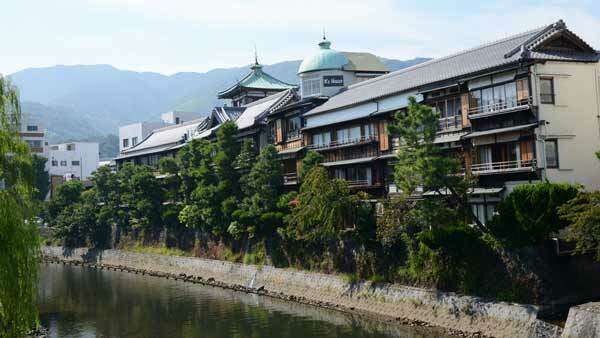 The Imperial Household's Goryo Onsen is one of Japan's Three Great Onsen hot springs, along with Arima in Hyogo Prefecture and Dogo in Ehime Prefecture. These hot springs, located upstream of the Natorigawa river, have a proud history that dates back 1400 years since they were first opened. The area is currently bustling as a back parlor of Sendai. 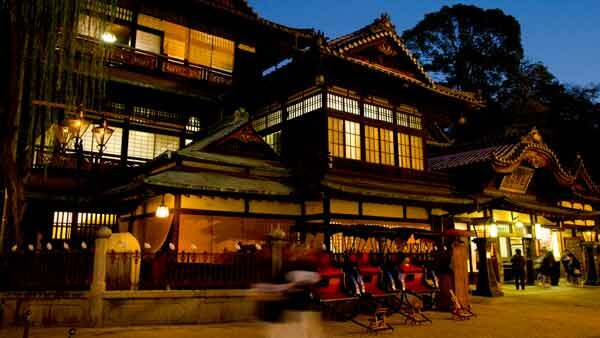 Dogo Onsen hot springs boast a history of 3,000 years. The is the same place that famously appeared in Japan's ancient history book, The Chronicles of Japan. 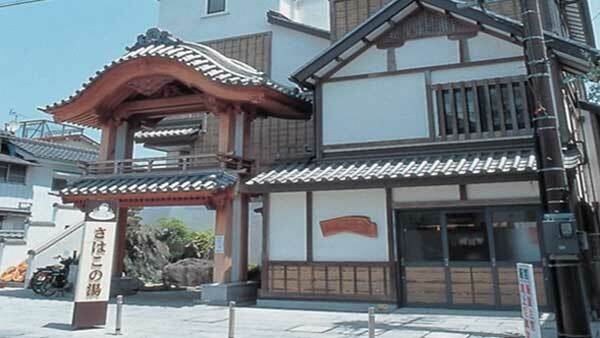 The public baths at the Dogo Onsen Main Building are the central symbol of the town, and the building itself has been designated as an important cultural property of Japan. 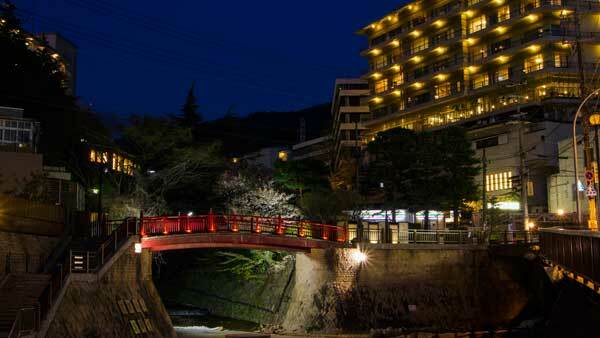 This hot springs resort area is one of Japan's Three Great Springs, with high-quality water and many repeat visitors. 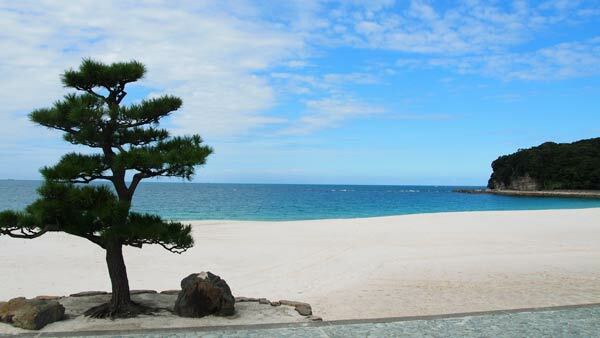 It is also popular because of its closeness and easy access--only about an hour and a half by car or train from Nagoya. Enhanced by views of the nearby tall mountains, meals at the area's many inns are renowned for their ever-popular "Hida beef" dishes. Lining both sides of the symbolic street of 365 stone steps are numerous Japanese traditional hot springs inns, souvenir shops, play spots for shooting and other games, and restaurants. The spring sources are called the Golden and the Silver. The Golden spring water emerges from a brownish source and flows under the stone steps, where it is divided among the inns. The Silver is a clear spring source that was discovered in 1996. This hot springs area spreads out around the base of the conical Mt. 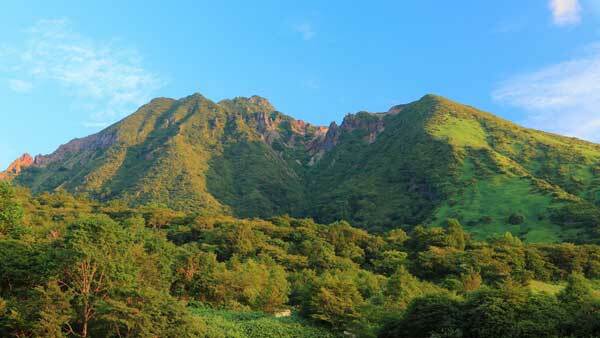 Yufu, a volcanic mountain that is nicknamed Bungo-Fuji. Unlike the more ancient hot springs towns, this place rocks with galleries that show works by young artists, a dazzling variety of one-of-a-kind shops, and exquisitely stylish restaurants. You will surely enjoy strolling among them. One of Japan's Three Great Springs, this area includes a lovely variety of spring types, including a strong salty rust-colored iron-rich spring, a radium-rich spring (called the Radon Spring), and a carbonate "baking soda" spring. These springs are called the Brown Golden Spring and the Clear Silver Spring. According to legend, these hot springs were discovered by a crane over 1,600 years ago. 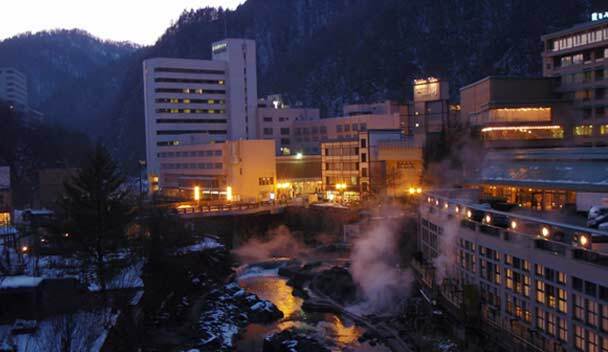 The town flourished as a post town with an abundance of water from its hot springs. 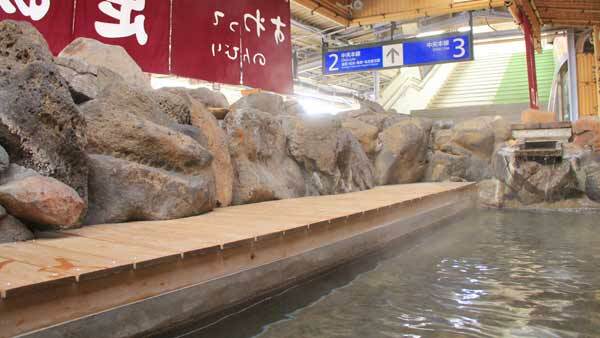 Hot springs have now have sprung up everywhere, even on a train station platform. The spring water is gentle to the skin yet it is said to help alleviate female concerns and skin disorders. 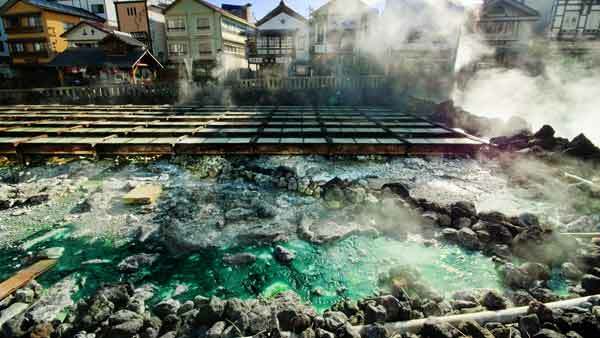 These hot springs served as the backdrop to Yasunari Kawabata's classic novel Snow Country. The springs were first developed in the early Kamakura period. 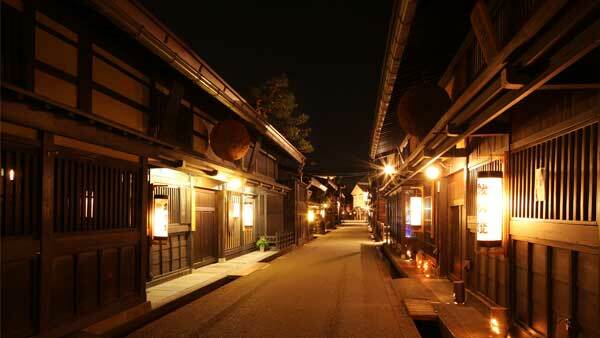 The town that grew around them prospered as a post town on the Mikuni Road during the early Edo era. In recent years the area also developed as a ski resort. Old-fashioned hot springs inns and modern hotels coexist here. Here is where the truly gorgeous Takayama festival takes place every spring and autumn. And here, at famous Hida-Takayama, with a streetscape that that even today retains the mood of an old castle town, there are new, deep hot springs gushing forth. There are four spring sources, each with differing water quality, and some of the bathing facilities are set up to host day-trip visitors. As one of the largest spa towns of Hokkaido, this hot springs area has been known by the nickname "Sapporo's back parlor" since ancient times. Access is excellent, as the area is located only about 30km from the center of Sapporo, an easy one hour drive or train ride. 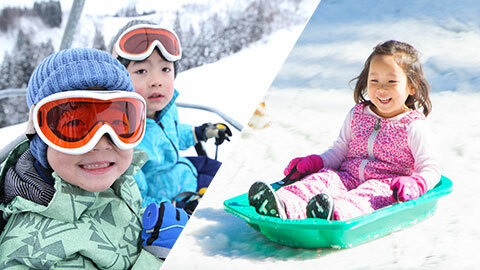 Nearby you can find the Hoheikyo dam, free footbaths, the Sapporo International Ski Slope, and a substantial number of other tourist attractions. 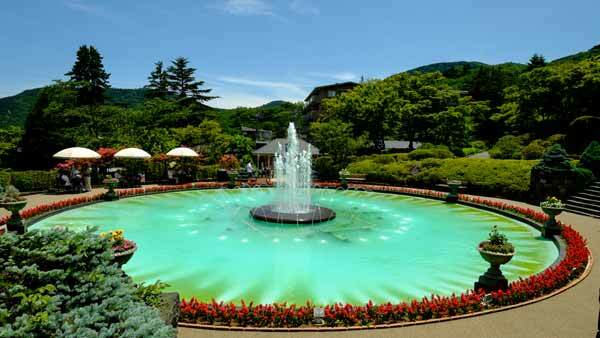 This hot springs resort at the entrance to Hakone is very old, having been established in the year 738. 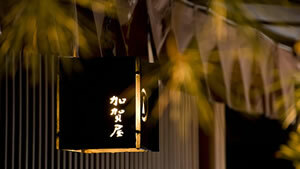 It has more spring sources than any other place in Hakone, and is known as the central hot spring resort there. This lovely scenic hot spring is located on the eastern slope of Mt. Sounzan. Among Hakone's seventeen hot springs, this one is relatively new, having joined their ranks only when the Hakone Touzan Railway was built in 1919. In the summertime you can also enjoy the spectacle of a huge red burning Japanese character meaning "big" visible high on the mountainside of Myojogatake. This town is full hot water that gushes out everywhere. It is piped, not just to hot spring inns, but to the train station, schools, offices, and regular homes. The geyser spray rising from the nearby lake is also famous. 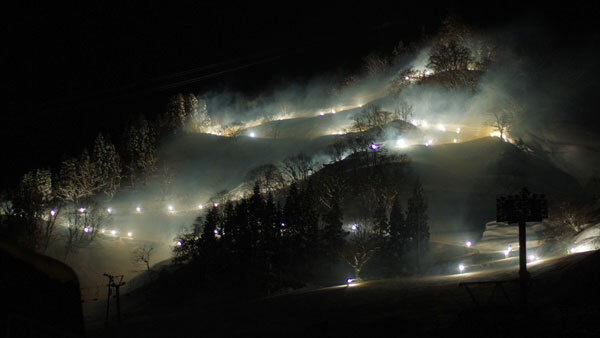 Fireworks displays and tourist attractions such as Kirigamine-Tateshina are popular here. 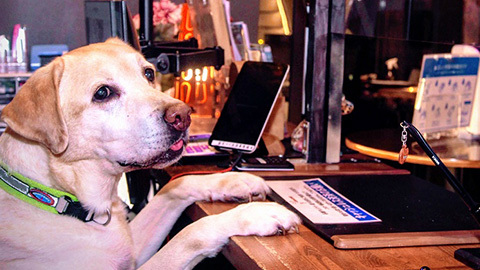 ※ These rankings were independently compiled based on Rakuten Travel's actual figures for overnight stays for the period from November 1, 2014 to October 31, 2015.